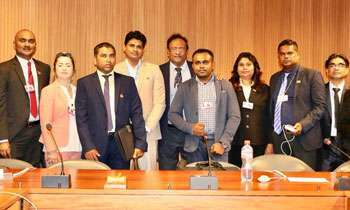 Rajarata university’s senior lecturer Prof. Channa Jayasumana, who was in Geneva to counter the pro-LTTE Tamil diaspora, urged the United Nations Human Rights Council (UNHRC) to rescind Resolution 30/1 on Sri Lanka. Addressing the council earlier this week, he said the responsibility of Human Rights bodies and mechanisms was to ensure that humans rights were protected. The professor said the LTTE resorted to terrorism to divide Sri Lanka on ethnic lines and it violated the rights of all communities but unfortunately, human rights champions remained silent. Dont step out of your expertise, professor.